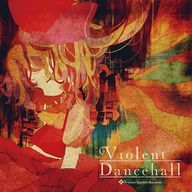 Violent Dancehall is a doujin album by Frozen System Records released on 2012-05-27 (Reitaisai 9). It features vocal and instrumental arrangements of themes from Lotus Land Story, Embodiment of Scarlet Devil, Perfect Cherry Blossom, Mountain of Faith, Subterranean Animism, Undefined Fantastic Object and Ten Desires. This page was last edited on 17 March 2017, at 13:52.